The Gap vs. 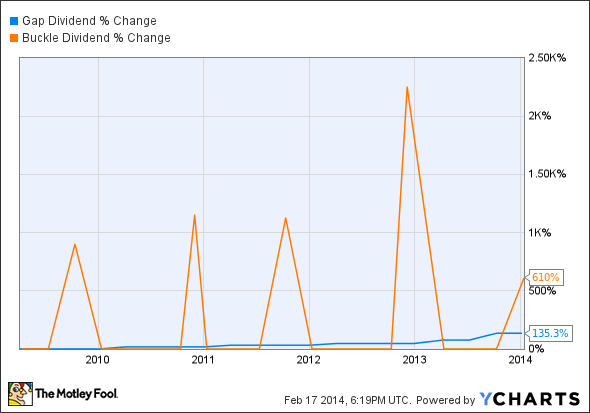 The Buckle: Which Stock's Dividend Dominates? Two fashion retailers square off in a battle of dividend fundamentals. But few of us can invest in every single dividend-paying stock on the market, and even if we could, we're likely to find better gains by being selective. Today, two popular mall-based fashion retail chains will square off in a head-to-head battle to determine which offers a better dividend for your portfolio. Founded in 1969, The Gap (NYSE:GPS) is a global specialty apparel retailer that offers clothing, accessories, and personal care products for men, women, and children. The company operates retail stores primarily under the Gap, Old Navy, and Banana Republic banners, while newer brands Piperlime and Athleta are also offered in domestic and international markets. Headquartered in San Francisco, Gap has more than 137,000 employees, and operates more than 3,500 company-owned and franchised stores throughout Asia, Europe, Africa, the Middle East, and the U.S. However, Gap recently finalized plans to shut down around 189, or 21%, of its domestic stores by the end of 2013, while simultaneously expanding its geographical presence in China and Brazil. Founded in 1948, The Buckle (NYSE:BKE), formerly known as Mills Clothing, is a leading retailer of footwear, casual apparel, and accessories for men and women in the U.S. The company operates stores under the Buckle banner, primarily in regional shopping malls and lifestyle centers, and has also begun selling products online. Headquartered in Kearney, Neb., Buckle employs more than 8,000 people in more than 450 stores in 43 states. Buckle boasts a strong product portfolioof ubiquitous brands, such as Lucky, Hurley, Roxy, Silver, Billabong, Fossil, and Ed Hardy. Since 2010, the company has opened a new state-of-the-art distribution center in Kearney, and also undertook the opening of 50 new stores, 21 full remodels, and 20 smaller remodeling projects. According to Dividata, Gap has paid uninterrupted quarterly dividends for more than 26 years since initiating distributions in 1987. On the other hand, Buckle only started paying quarterly dividends in late 2003. A 26-year dividend-paying streak lets Gap win the endurance crown without breaking a sweat. According to Dividata, Gap started raising shareholder distributions in 2010 after holding fast for two years due to the financial crisis. By contrast, Buckle has increased its dividend payouts at least once every year since it began paying back shareholders in 2003. That's an easy win for Buckle. 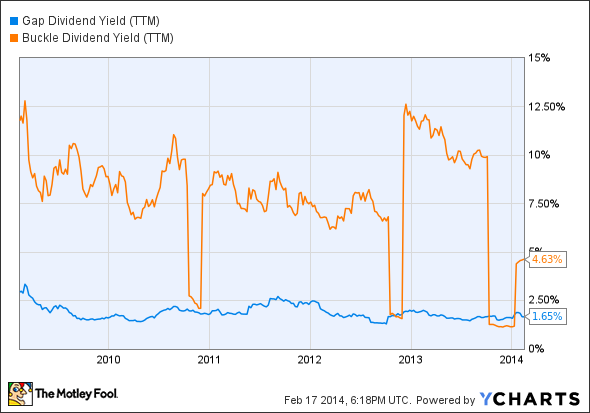 GPS Dividend Yield (TTM) data by YCharts. GPS Dividend data by YCharts. 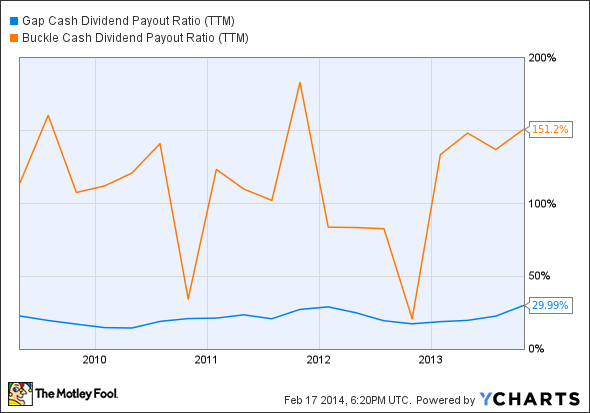 GPS Cash Dividend Payout Ratio (TTM) data by YCharts. Buckle may have won the best-of-five on the basis of its history, but investors should never base their decisions on past performance alone. Tomorrow might bring a far different business environment, so it's important to also examine each company's potential, whether it happens to be nearly boundless, or constrained too tightly for growth. Gap is putting Athleta in direct competition with lululemon athletica's locations to draw in customers with lower prices. Gap opened 25 new stores in Asian markets out of 65 total new openings in the third quarter. Gap recently announced a $1 billion share repurchase plan to win shareholders' confidence. Gap teamed up with new designers to develop innovative products to lure more customers. Buckle plans to open 16 new stores and complete 14 to 16 full remodels by the end of 2014. Buckle benefits from dynamic inventory and cost-management initiatives. Buckle has been expanding its product portfolio to include activewear and footwear. The global market for denim jeans is expected to grow to $56 billion by the end of 2018. Under Armour is also pushing hard into yogawear with an athlete-centric marketing campaign. Under Armour has also been opening new stores aimed at young athletic girls. Nike is similarly focused on the women's yoga-apparel business. Gap's core Gap and Banana Republic brands seem to be gaining traction with shoppers. Denim retailers have been overlooked as shoppers focus on larger investments and purchases. In this writer's humble opinion, it seems that The Buckle has a better shot at long-term outperformance, thanks to a strong competitive and pricing advantage over peers that more typically retail only in-house brands. Buckle's management seems confident that it can spark significant revenue growth on the back of rising global demand for denim wear, combined with a diversification into activewear and footwear. While Gap has been aggressively expanding into new international locations, its recent domestic shutdowns are a bad sign for the future appeal of its core brands. You might disagree and, if so, you're encouraged to share your viewpoint in the comments below. No dividend is completely perfect, but some are bound to produce better results than others. Keep your eyes open -- you never know where you might find the next great dividend stock!